Alastair Cook, England's former captain and all-time leading Test run-scorer, is set to receive a knighthood in the New Year's honours, after bowing out of international cricket with a 33rd and final century against India this summer. According to a report in The Times, Cook, who turns 34 on Christmas Day, will become the first England cricketer to be knighted since Sir Ian Botham back in 2007, and only the tenth overall. In the course of one of the most indomitable Test careers of all time, Cook amassed a total of 12,472 Test runs in 161 England appearances, both national records, the latter including an unprecedented 159 matches in succession. The only Test that Cook missed in the course of a 12-year England career was at Mumbai on England's tour of India in March 2006. It was the same trip on which he marked his debut with a century at Nagpur, at the age of 21, having flown halfway around the world from the Caribbean as a last-minute injury replacement. Cook's career included a five-year tenure as England captain, from 2012 to 2017. In that period, he led his country in a record 59 Tests, winning the Ashes twice on home soil, in 2013 and 2015, and leading from the front with three centuries on a famous 2-1 series win in India in 2012-13. His most prolific series with the bat, and arguably his most famous hour, came on the Ashes tour of 2010-11 when he racked up 766 runs in five Tests, including a then-Test-best of 235 not out at Brisbane, to underpin England's first series win in Australia since 1986-87. Though his returns fell away in the final 18 months of his career, Cook's tenacity remained at the forefront of his game to the bitter end, with two more double-centuries against West Indies and Australia in the final 12 months of his career, prior to an extraordinary send-off in his final match against India at The Oval in September. 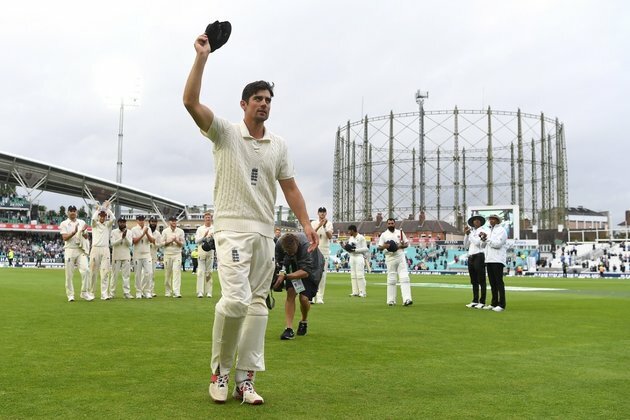 Having announced his impending retirement, following a fallow summer in which he had made a solitary half-century in ten innings against Pakistan and India, Cook followed up a first-innings 71 at The Oval with a commanding 147 in the second, a brace of scores which echoed his fifty/hundred achievement on debut 12 years earlier and culminated in an extended standing ovation as England pressed on to a memorable 118-run win. Though Cook has retired from England duty, he will remain available for the foreseeable for his county, Essex, with whom he recently signed a new three-year deal. As and when he takes the field in the 2019 season, Cook is set to become the first active professional cricketer with a knighthood since Sir Richard Hadlee bowed out on New Zealand's Test tour of England in 1990.